Want to feel confident about replacing that struggling rosebush, start a new garden, or identify poison ivy? 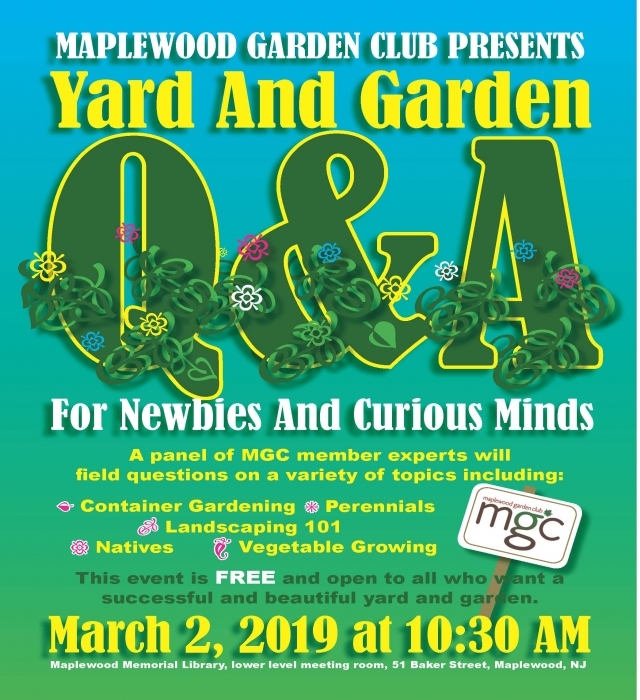 Then don’t miss Maplewood Garden Club’s upcoming workshop, “Yard and Garden Q&A for Newbies and Curious Minds,” where a panel of MGC gardening experts, including Master Gardeners, will field questions on a wide variety of topics. The workshop will be held on Saturday, March 2, starting at 10:30 AM in the lower-level meeting room at Maplewood Memorial Library, 51 Baker Street. Whether you’re new to yard and garden care or a more-seasoned-but-hesitant gardener, you’re sure to find inspiration and learn something new after talking to the MGC pros. Come armed with questions and pictures! The event is free and open to all. No RSVP is required.